"Behind every great president is a small group of advisors selflessly devoting themselves to the task of making their president as successful as possible. Missy LeHand was one of the people who enabled Franklin D. Roosevelt to become the FDR of history. Kathryn Smith makes a brisk and compelling case that Missy LeHand was one of the most important women of the Twentieth Century." 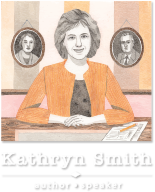 "Kathryn Smith’s THE GATEKEEPER is a vivid, much-needed life of one of the least-known but most consequential figures in FDR’s immediate circle, Missy LeHand. Anyone interested in Roosevelt, the New Deal or the path toward global war will want to snap it up. " "Missy LeHand was one of the most powerful women of 20th-century Washington, yet since World War II her name has faded from public awareness. Kathryn Smith has restored LeHand to her proper place with a rich and poignant biography, deeply researched and thoroughly absorbing." "In ‘The Gatekeeper’, Kathryn Smith does full justice to the fascinating and heartbreaking life of Missy LeHand, who rose from a working-class background to become a close confidant and trusted adviser to Franklin D. Roosevelt and one of the most influential figures in his administration. Although Missy’s total devotion to FDR made her indispensable to him, she sacrificed much in the process, including other personal relationships and, ultimately, her life. Thanks to Smith, she is — at long last — getting the recognition she deserves." "For the two decades between 1921 and 1941, no one spent more time with Franklin Delano Roosevelt than Marguerite 'Missy' LeHand. From modest Irish Catholic Boston roots, Missy rose to become an indispensable intimate confidante, adviser, chief of staff and exclusive conduit to the most consequential personality of the twentieth century. No woman has ever wielded more influence in a presidential administration. Likewise, Missy was admired and respected by Eleanor, the Roosevelt children, and every other key member of the Roosevelt administration. Because of a severely disabling stroke at just forty-four years of age, Missy’s contribution to history has been marginalized and nearly forgotten. This definitive biography, published with the authority of her family and containing much information never before revealed, is long overdue, and will finally afford Missy the credit she deserves as one of the most important female figures in American history."